The Visitor Centre is the first point of contact for all visitors to the Innovation Park @Ravenscraig. The flexible space allows a variety of meetings, seminars and events to be held. The Visitor Centre will be a working office, home to permanent BRE Scotland staff and will also act as an information hub for research, monitoring and testing being undertaken at the Park. 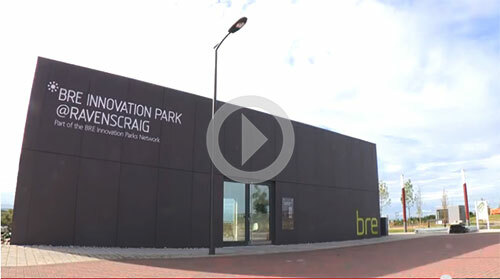 Below is a full length film showing the construction of the BRE Visitor Centre at the Innovation Park @Ravenscraig. CCG (Scotland) Ltd., Edinburgh Napier University, Scottish Enterprise, Ravenscraig Ltd. The BRE Visitor Centre is a rectangular cuboid in shape with an open plan layout. The service area is located in one corner, with toilets, kitchen and plant room. The rest of the floor plan is open to allow maximum space for seminars and events. The building is constructed from a closed panel timber system. CCG’s iQ System delivers modular closed wall and roof panels in a flexible, lean construction method with zero onsite and offsite wastage. 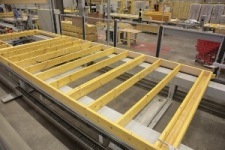 The building design, and this construction method results in low linear thermal bridging. The iQ System incorporates C16 Homegrown Timber, grown and milled in Scotland. The use of this modern method of construction (MMC) panel system allows for fast crane erection on site and safer assembly. The homegrown timber components for the construction of the visitors centre were provided by BSW Timber. The timber came from certified forests, with robust environmental credentials, around Speyside and Loachaber and was then processed locally at BSW's Highland mills at Fort William and Boat of Garten. The timber was constructed into panels by CCG in Cambuslang and then had only a short trip to Ravenscraig. Using locally sourced materials and local companies in this way has greatly reduced the amount of 'timber miles' compared to sourcing similar products from Scandinavia. BSW Timber also supplied timber sub-components for the innovative cross-laminated timber (CLT) panels used to create a feature internal wall in the Visitor Centre. A CLT panel is formed from layered timber sections, with the grain in each layer running perpendicular to the next. The layers are formed into a panel by treatment with resin and high pressure to bond them together. A ceiling panel system incorporating Phase Change Material will be provided by Armstrong. CoolZone is an innovative ceiling solution that absorbs heat during the day and releases it at night, to keep the Visitor Centre at a constant temperature. Phase Change Material adds to the thermal mass and melts and solidifies at specific temperatures allowing it store large amounts of energy. Fermacell will provide their revolutionary 'Greenline' building boards which absorb and neutralise Volatile Organic Compounds (VOCs), improving the air quality inside the Visitor Centre. VOCs are emitted as gases by a range of products including some paints, glues, laminates and electrical equipment. 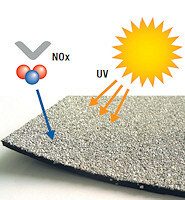 Some VOCs may have short or long term adverse health effects for the building occupants. 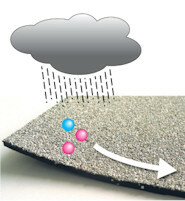 Icopal are providing a Noxite roofing membrane which uses sun, wind and rain to transform harmful nitrogen oxides into harmless nitrates. 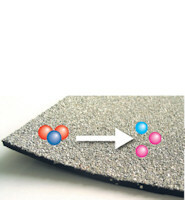 The granular titanium dioxide finish is activated by UV radiation from the sun and converts nitrogen oxide (NOx) particles (carried by polluted air) into nitrates, which are then washed away by rainfall. NOx is one of six greenhouse gases which are identified by the Intergovernmental Panel on Climate Change as being harmful to the environment. Funding from Architecture+Design Scotland and Scottish Enterprise has allowed for the filming and production of a video capturing the development of the Visitor Centre from early planning to completion. A 15-20 minute film and a short 3-4 minute dynamic summary will be created to showcase the innovative and sustainable techniques and technologies utilised and to demonstrate the abilities of the Scottish Construction sector. The film is being created and produced by Scope Productions, working with BRE Scotland and Forestry Commission Scotland. As part of the film process a time lapse camera has been installed at the Innvoation Park to capture the ongoing activities on site.